It ain’t over until the Fat Lady sings - and Saints will need no reminding their semi-final spot in the Super 8s is still up for grabs. 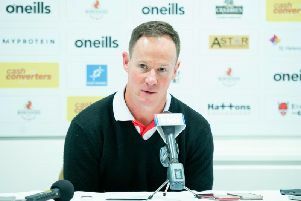 Despite Friday night’s 16-14 defeat against fellow title challengers Leeds Rhinos, Justin Holbrook’s side cannot be disregarded and in a competition which has had more twists and turns than a country lane in terms of results anything is possible. League Leaders’ Shield winners Castleford have already booked a home tie and it is likely they will be joined by the Rhinos, Hull FC and one other. But who will that be? Saints, Wigan Warriors, and Wakefield Trinity all fancy their chances to claim fourth place and even out-of-sorts Salford and Huddersfield Giants - shock winners at Hull on Friday - won’t rule themselves out such is the cpmplexity of the run-in. They all face four tough-looking and crucial fixtures but locally none whets the appetite more than the Saints-Wigan derby at the Total Wicked Stadium on Friday, September 1. It is the night Aussie Ben Barba is expected to make his debut for the hosts after serving a 12-match ban for a drugs offence Down Under but it will be fascinating to see what role he will occupy if Holbrook has a fully fit squad to chose from. His presence will certainly be a major boost after two successive defeats in which Saints haven’t been at their best. The match at Leeds was little more than a damp squib - full of errors and neither side able to produce the type of free-flowing attacking play on which they both built their reputations. But Saints’ boss Holbrook was more than happy with his side’s performance in an encounter where defences were the dominant force. He said: “I couldn’t be prouder of my team but unfortunately that’s two weeks in a row we’ve been beaten by two points. “I don’t think we played poorly. We didn’t have much ball in the second half but only lost by two points against a very tough side.